Executive Committee of the Portolá Festival. To thee beside the Western Gate." In the annals of adventure, there are no more thrilling narratives of heroic perseverance in the performance of duty than the record of Spanish exploration in America. To those of us who have come into possession of the fair land opened up by them, the story of their travels and adventures have the most profound interest. The account of the expedition of Portolá has never been properly presented. Many writers have touched on it, and H. H. Bancroft, in his History of California, gives a brief digest of Crespi's diary. Most writers on California history have drawn on Palou's Vida del V. P. F. Junipero Serra and Noticias de la Nueva California, and without looking further, have accepted the ecclesiastical narrative. We have endeavored in this sketch to give, in a clear and concise form, the conditions which preceded and led up to the occupation of California. The importance of California in relation to the control of the Pacific was early recognized by the great European powers, some of whom had but small respect for the Bull of Pope Alexander VI dividing the New World between Spain and Portugal. England, France, and Russia sent repeated expeditions into the Pacific. In 1646 the British Admiralty sent two ships to look in Hudson's Bay for a northwest passage to the South Sea, one of which bore the significant name of California. The voyage of Francis Drake, 1577-1580, was a private venture, but at Drake's Bay he proclaimed the sovereignty of Elizabeth, and named the country New Albion. Two hundred years later (1792-1793) Captain George Vancouver explored the coast of California down to thirty degrees of north latitude (Ensenada de Todos Santos), which, he says, "is the southernmost limit of New Albion, as discovered by Sir Francis Drake, or New California, as the Spaniards frequently call it." Even after the occupation and settlement by the Spaniards, so feeble were their establishments that, as Vancouver reports to the Admiralty, it would take but a small force to wrest from Spain this most valuable possession. But though the growing feebleness of Spain presaged the time when her hold upon America would be loosened, the standard of individual heroism was not lowered, and the achievements of Portolá and of Anza rank with those of De Soto and Coronado. The California explorer did not, it is true, have to fight his way through hordes of fierce natives. The California Indians, as a rule, received the white adventurers gladly, and entertained them with such hospitality as they had to offer, but the Indians north of the Santa Barbara Channel were but a poor lot. In a country abounding in game of all kinds, a sea swarming with fish, a soil capable of growing every character of foodstuff, these miserable natives lived in a chronic state of starvation. As in heroic qualities, so also in skill and judgment, Portolá upholds the best traditions of Spain. The success of an expedition depends upon the character of the leader. Pánfilo de Narváez landed on the coast of Florida in April, 1528, with a well-equipped army of three hundred men and forty horses, just half the force he sailed with from Spain the previous June, and of the three hundred men whom he led into Florida, only four lived to reach civilization - the rest perished. That is but one example of incompetent leadership. When Portolá organized his expedition for the march from San Diego Bay to Monterey, many of his soldiers were ill from scurvy, and at one time on the march the sick list numbered nineteen men, including the governor and Rivera, his chief officer. Sixteen men had to be carried, and to three, in extremis, the viaticum was administered; but he brought them all through, and returned to San Diego without the loss of a man. There are two full diaries of this expedition, one by Father Crespi and the other by Alférez Costansó. There is, besides, a diary of Junípero Serra of the march from Velicatá to San Diego Bay, a translation of which is printed in Out West magazine (Los Angeles), March-July, 1902. It is of small value to the student of history. 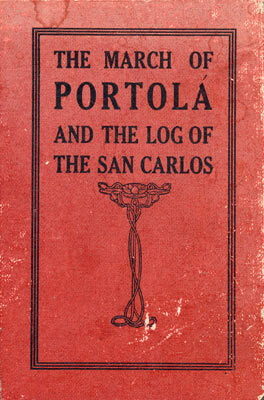 There is a diary by Portolá, quoted by Bancroft, and a Fragmento by Ortega, also used by Bancroft. These we have not seen. There are letters from Francisco Palou, Juan Crespi and Miguel Costansó, printed in Out West for January 1902. The diary of Father Crespi is printed in Palou's Noticias de la Nueva California. Documentos para la Historia de Mexico, re-printed San Francisco, 1874. The diary of Miguel Costansó is in the Sutro library. It has never been printed. It is prefaced by an historical narrative, a poor translation of which was published by Dalrymple, London, 1790, and a better one by Chas. F. Lummis in Out West, June-July, 1901. In Publications of the Historical Society of Southern California, Vol. II, Part 1, Los Angeles, 1891, a number of documents of the Sutro collection are printed, with translations by George Butler Griffin. These relate to the explorations of the California coast by ships from the Philippines, the two voyages of Vizcaino, with some letters of Junípero Serra, and diaries of the voyage of the Santiago to the northern coast in 1774. The sketch here submitted is the result of much study of original documents, and the route of the expedition is laid down after careful survey of the physical geography where possible, and in other cases, by the contoured maps of the Geological Survey, following the directions and language as given by the diarists. Among the printed books consulted are Palou's Vida del Padre Junipero Serra and his Noticias de la Nueva California, above noted. The Conquest of the Great Northwest, Agnes C. Laut, New York, 1908; History of California by H. H. Bancroft; Treaties of Navigation, Cabrera Bueno, Translation, Dalrymple, London, 1790; The Discovery of San Francisco Bay, George Davidson, and Francis Drake on the Northwest Coast of America in 1579, the same author; Proceedings of the Geographical Society of the Pacific. In view of the forthcoming Portolá Festival, The California Promotion Committee, through its Reception Committee, appointed three of its members to compile a history of the first expedition for the settlement of California. In the endeavor to obtain further knowledge of the life and character of Portolá, the committee has been enabled, through the efforts of one of its members, to have careful search made among the archives of Madrid, of the India Office at Saville, of the City of Mexico, and of Puebla, and while we have little to show, as yet, concerning Portolá, we have received other documents of the utmost importance to the history of San Francisco: a chronicle of the events following the discovery of the Bay. By royal edict, a maritime expedition for the exploration of the northwestern coasts of America sailed from San Blas early in the year 1775. This consisted of the frigate Santiago, under the commander-in-chief, Don Bruno de Heceta; the packet boat San Carlos, under Lieutenant Ayala, and schooner Sonora, under Lieutenant Bodega. To Lieutenant Ayala was assigned the exploration of the Bay of San Francisco, while the Santiago and the Sonora sailed for the north. Bodega discovered the Bay which bears his name, and Heceta (to spell his name as it is usually written) discovered the Columbia River. Bancroft (History of California), in giving Palou's Vida as authority for his short and incorrect account of Ayala's survey, says: "It is unfortunate that neither map nor diary of this earliest survey is extant." It is with pleasure we are permitted to present to the public these important documents, now printed for the first time, and only regret that the shortness of time allowed for their study may perhaps necessitate later some minor corrections. We have also received from the Minister of Marine of Spain, Don José Ferrano, under date of July 14, 1909, a drawing of the paquebot, San Carlos, together with the record of her gallant commander, Don Juan Manuel de Ayala. Ayala was born in Osuna, Andalucia, on the 28th of December, 1745. He entered the Marine Corps on the 19th of September, 1760, and was made Alférez de Fragata, October 10, 1767; Alférez de Navio, June 15, 1769; Teniente de Fragata, April 28, 1774; Teniente de Navio, February, 1776; and Capitan de Fragata, December 21, 1782. When the order for the exploration of the northern coast was made, Ayala was one of the officers assigned to the work. He arrived in Vera Cruz in August, 1774, proceeded to the City of Mexico, and was ordered by Viceroy Bucareli to San Blas, where he was given command of the schooner Sonora. The squadron under Heceta had hardly got under way, when the commander of the San Carlos, Don Miguel Manrique, suddenly went mad. Ayala was ordered to the command of the packet-boat, and returned to San Blas with the unfortunate officer, to follow the squadron a few days later. In December, 1775, Ayala conducted a reconnaissance on the coast of New Spain, and at its conclusion was placed in command of the Santiago, and until October, 1778, served the new establishments of California. In August, 1779, he was sent to the Philippine Islands in command of the San Carlos, returning to San Blas in 1781. In July, 1784, he returned to Spain, and on March 14, 1785, was retired, at his own request, the royal order granting him full pay as captain of frigate in consideration of his services to California. He died December 30, 1797. San Francisco, August, 1909. - Committee.